Scientists believe a new treatment, shown to be effective in mice, could halt the growth of tumours in patients with prostate cancer. The findings, published today in the journal Oncogene, show that targeting a molecule called SRPK1 could stop progression of prostate cancer. SRPK1 plays a vital role in 'angiogenesis' - an essential process through which tumours are able to form blood vessels and obtain necessary nutrients to fuel their growth. This process is mainly regulated by VEGF - vascular endothelial growth factor - which can activate or inhibit vessel formation depending on how the gene is controlled by a cellular process called 'alternative splicing'. Dr Sebastian Oltean, the study's co-author from the University of Bristol's School of Physiology and Pharmacology, said: "We reasoned that inhibition of SRPK1 activity could stop cancer progression. Indeed, we show in this paper that if we decrease SRPK1 levels in prostate cancer cells, or in tumours grafted into mice, we are able to switch VEGF splicing and therefore inhibit tumour vasculature and growth." Professor David Bates, co-author from the University of Nottingham's Division of Cancer and Stem Cells, said: "Our results point to a novel way of treating prostate cancer patients and may have wider implications to be used in several types of cancers." Dr Matthew Hobbs, Deputy Director of Research at Prostate Cancer UK, said: "There's no denying that there are too few treatment options for the 40,000 men that face a diagnosis of prostate cancer every year in the UK - especially for those with advanced disease. Prostate cancer continues to kill over 10,000 men annually and there is an urgent need for new treatments if we are to significantly reduce this figure. 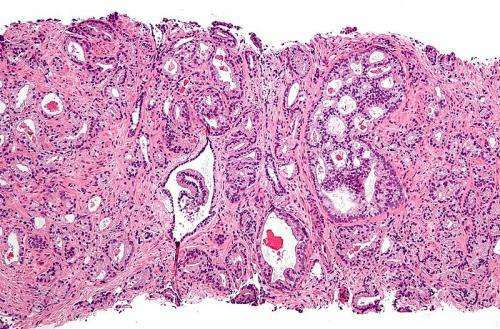 "Although it's early days, each finding like this represents a crucial block in building up our understanding of what can slow down and stop the progression of prostate cancer. This understanding will give us the foundations needed to develop new targeted treatments for those men in desperate need." More information: 'Serine arginine protein kinase-1 (SRPK1) inhibition as a potential novel targeted therapeutic strategy in prostate cancer' by Athina Mavrou, Karen Brakspear, Maryam Hamdollah-Zadeh, Gopinath Damodaran, Roya Babaei-Jadidi, Jon Oxley, David A Gillatt, Michael R Ladomery, Steven J Harper, David O Bates and Sebastian Oltean in Oncogene.